Clearview Home Energy Solutions is committed to progressive home improvement. Anaheim, CA 9/12/2014 – With the end of summer it is time for homeowners to start thinking about making their homes more energy efficient. And the professionals at Clearview Home Energy Solutions have the products and services that can help you achieve that goal. Clearview Home Energy Solutions is a specialty contractor with more than fifty years of collective experience in windows, doors, exterior coatings, insulation, vinyl, heating and air conditioning, and solar. With Clearview’s expertise, you can turn your home into an energy efficient, green home that you can be proud of. Clearview wants to help each of its clients go green. But those are more than just trendy buzzwords. At Clearview Home Energy Solutions, our concept is to turn your home from an energy deficient environment, into one that is energy efficient. Using the best and greenest products now on the marketplace, Clearview Home Energy Solutions will replace your homes with windows from Anlin Windows, and the exterior coating with Textured Coating of America that goes over stucco or wood. We use soffit and fascia vinyl siding from Alcoa, wall, ceiling and attic insulation from Cocoon, and heating and air conditioning from American Standard. The Clearview Home Energy Solutions craftsmanship cannot be beat; our technicians and installers are factory trained and certified to exceed industry standards. And all of the products from Clearview Home Energy Solutions come with lifetime warranties. At Clearview Home Energy Solutions, we are committed to socially and environmentally progressive home improvement. As home improvement specialists, the professionals at Clearview Home Energy Solutions are committed to outstanding customer service and reliability; these are the essential components to the success of each project. Clearview Home Energy Solutions is not willing to compromise your project to save a few bucks. We understand that your home is your most valued asset, and you, as our client, are our most valued asset. 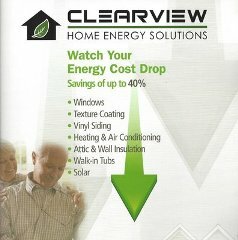 About: Clearview Home Energy Solutions makes progressive home improvement easy. Find out what the customers have to say at Clearview Home Energy Solutions Reviews website.